Keratoconus is a degenerative disorder of the eye in which structural changes within the cornea cause it to thin and change to a more conical shape than its normal gradual curve. 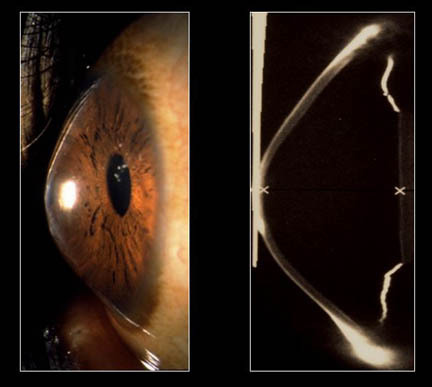 Despite considerable research, the etiology of keratoconus remains somewhat of a mystery. Keratoconus likely arises from a number of different factors: genetic, environmental or cellular, any of which may form the trigger for the onset of the disease. People that have keratoconus often also have allergies. Hayfever, skin allergies, and asthma are common. This indicates the immune system has been compromized in people with Keratoconus. A treament protocal for Keratoconus would involve detoxification to remove any toxicity factors. A genetic predisposition to keratoconus has been observed there for any successful treatment would have to boost cellular integrity and boost immune performance. Supplementation should include natural juices (organic if possible), herbs, and supplement with possible benefits to eyesight. Reason For Recommendation: Proven theraputic result and the most effective means to destoxify the body. Barley Green Powderer: 1 tablespoon per day. Raw Eggs: dosage 2 per day that can be blended with the juice. Organic free range where possible. Risks: Salmonella A study by the U.S. Department of Agriculture in 2002 (Risk Analysis April 2002 22(2):203-18) It showed that of the 69 billion eggs produced annually only 2.3 million are contaminated with salmonella—equivalent to just one in every 30,000 eggs. Reason For Recommendation: The best source for Lutein is the egg yolk, followed by green vegetables such as Spinach, and broccoli. Egg yolks also have zeaxanthin to protect eyesight. Lutein is found to be most helpful with macular degeneration. High in lecithin that is crucial for cellular integrity. Lecithin Capsules: 8 per day with selenium. Reasons For Recommendation: Lecithin is a phospholipid meaning it has a phosphate part and a lipid part. This means that it has both water loving and water hating parts which makes it great for use in the body in places like the mucous membranes. Lecithin is necessary for the healthy function of every bodily cell. Lecithin is one of the major components of the cell membrane, that thin semi-permeable layer that envelope the surfaces of cells. B2 (riboflavin) A treatment developed at the Technische Universität Dresden, and which has shown early success is Corneal Collagen Crosslinking with Riboflavin, also known as CXL, CCR, and CCL. A one-time application of riboflavin solution is administered to the eye and is activated by illumination with UV-Alight for approximately 30 minutes. The riboflavin causes new bonds to form across adjacent collagen strands in the stromal layer of the cornea, which recovers and preserves some of the cornea’s mechanical strength. The corneal epithelial layer is generally removed in order to increase penetration of the riboflavin into the stroma. A deficiency of vitamin B2 (riboflavin) may result in bloodshot eyes, abnormal sensitivity to light, itching and burning of the eye. Clearly there is a relationship between vitamin B2 and eyesight. Foods rich in riboflavin are green vegetables such as lotus stems, turnip greens, beets, radish leaves, colocasia and carrot leaves. Fruits such as papaya, raisins, custard apples and apricots are good sources of Vitamin B2 but only apples should be used on a juice therapy. The others food would be part of a post treatment diet. Deficiency of vitamin B2 (riboflavin) may result in bloodshot eyes, abnormal sensitivity to light, itching and burning of the eye. Vitamin B2 (riboflavin) Overdose, Toxicity, Side Effects: There is no known toxicity to riboflavin. Because riboflavin is a water-soluble vitamin, excess amounts are easily excreted by the body in the urine. Possible reactions to very high doses may include itching, numbness, burning or prickling sensations, and sensitivity to light. Excess riboflavin excreted in the urine causes it to become bright yellow in color, which many people notice when they take B vitamin supplements. Intacs are tiny, clear ring segments that are inserted into the cornea to provide stabilization and a more natural cornea curve. Hi, thanks for linking me to this page Tom. I’m going to buy the supplements over the weekend so I can start the treatment on Monday. A quick question, the b2 riboflavin, do you recommend I buy a supplement? And how much per day? Also what kind of fruits and vegs should I juice, and how much per day? I will try to make a log if I can figure it out, or do you set one up for me? The about of B2 was where I left off. Seems like there are no know toxicity levels. Not sure. There is lots in the eggs but B2 is a key factor. I would start at a lower does and increase. I need to find who has used B2 therapeutically. Or any case studies or published research. This treatment protocol will be ongoing. We can add to it. This was my basic research. Juice amount … just listen to your body. Once you start your body will guide you. You can juice any mix fruits and veggies. I am trying to research the ones that have had any therapeutic results for any eye condition. The shotgun approach to natural healing. If you are successful others can follow your version of the protocol. If we can have dramatic cancer cures, and with so many disease why not Keratoconus. If you want to help with the research that would be great. The fact that you are only affected in one eye rules out genetic factors. It may be infection triggered. That could account for the localized breakdown of cell wall integrity. I also need research on that with some searches like “candida eyesight”. Or any connection between Keratoconus and bacteria or fungi. If so it has penetrated deep into the tissue. Do you have any other symptoms that would indicate Candida or chronic infection. I think fungi reduction needs to be part of the program. You would be looking at a daily enema with salt and sodium bicarbonate. I just did a page on it just do a site search for sodium bicarbonate. What country are you in? Sorry I should have given a brief Medical history. I Live in England. I have Kerataconus in both eyes, and use Rigid Gas Permeable contact lens to manage, I cannot see very well without them. The kerataconus has progressed and got worse slightly over the years, and I am now very sensitive to light, and cannot leave the house on a sunny day without a cap or sunglasses. I started to wear Glasses at the age of 5 (Five), and my eyesight has deteriorated slightly ever since. I got diagnosed with kerataconus at the age of 18. I am now 24, and my eyes prescription is approximately -9 in the right and -6.5 in the left. I have Hayfever and dust allergies, and come to think of it, hayfever started to get worse at the same time I was diagnosed with kerataconus. I also had a little eczema type rash on my left knee cap since I was about 15, it was approx an inch in size, it grew extremly slowly, and i ignored it for years. I eventually went to the doctor, who prescribed a few things, until a final steroid based cream called hydrocortizone (I think) made it totally disappear, or atleast for a while. About 6 months or so later, a similar thing has appeared on the back of my neck, been there for 2 years, and i once again have ignored it. I dont know what it is or what it called, it does not itch at all, nor has it spread, kind of cropped up over night. Other than that I had a very mild case of athletes foot, which has pretty much cured using “Daktarin”. Also, every once in a while, I get a similar thing to the thing on the back of my neck, appear on the bottom of my rib cage, a small 1cm sized thing on either side at the bottom of my ribs, it stays only a few days, and is gone for a year or so. There is no other medical history I can think of, I dont know if these are fungal or candida/chronic etc, hopefully you can understand them better than me. I have ordered some of your recommended supplements and a few extra, should have them midweek. Are the above any good? recommended dosage? I also have some Cayenne pepper capsules which I filled myself, and have about 400 grams or so of Spirulina powder, would any of these be benificial? I will start juicing tomorrow to get back into the swing of things, (finished a 5 day fast a few days ago), and wait until the tablets etc get delivered and start a treatment protocol you recomended. I would love to help with your research, by posting a daily progress report if necessary. I am 43 years old and was diagnosed with Kerateconus 3 years ago Actually “Kerateconus Actesia” meaning “after lasik” surgery. I had lasik when I was 33 years old and it took over 10 years for this deasease to show it’s ulgly head. I knew there was a problem prior to being diagnosed as my vison would go “in and out” and docs said nothing wrong over and over again. It would go “in and out” based on what I eat, stress etc.. almost instantly. I do feel there is a direct correlation here as it still does this today. Based on todays data, I would not be a candidtae for Lasik. I had no idea that I had a thin cornea & was “borderline” at best in those days.. If would have known this, I would never had the surgey. since then, I went to Mexico- where I had R2 (riboflavin crosslinking)treatment in both eyes. I think it has “halted” the deases to a point. . I think my left eye has gotten a little worse since then and I am due for a check up. 1/ I like to work out – is this ok to work out hard while on this diet? 3/ I bought R2 supplement, pretty much all vitamens that is listed here.. will it all get digested if I am eating no real food? Based on the fact your hayfever started to get worse at the same time you were diagnosed with kerataconus indicates that your immune system is compromised and that may be due to fighting a systemic infection like candida. I would stay away from the fruit juices except blueberry. Dosage needs some research. Therapeutic dose is much higher than daily need. I would take a a standard amount then double and triple it. The one drawback with raw eggs can be deadly farts. And it looks like Mike could be your buddy on this climb. So glad you are along for the ride. On very interesting thing that you said was that after a fast there was an improvement of the condition. How long was the fast and what type. / I Yea you can do brutal workouts. 2/ That a good choice of juice mixes. 3/ With the juice or blended eggs it will digest. 4/ I would take the 1/30,000 chance of salmonella. Alternative would be natural juices if you are on the road but they will not sustain your energy. 5/ Samuel is you Buddy for sure. I have been researching candida, and I’m afraid it fits. Make a lot of sense, seems I have had it for years. What juices do you recommend I take? What is a standard dose of blueberries juice? Also tom what do you mssg of my supplements? I’m thinking of starting something tomorrow, should I take only Blueberry juice and water, along with 2 raw eggs per day, and ofcourse the supplement? Please advise so I can start ASAP. Mike, sorry to hear about your condition, did your previous juice fast improve your condition? And by how much? I’m more than willing to be your fasting buddy. Should we exchange email addresses? Also tom what do you make of my supplements? I’m thinking of starting something tomorrow, should I take only Blueberry juice and water, along with 2 raw eggs per day, and ofcourse the supplement? Your supplement list makes sense to me. Although many of the supplements and juicing has a long history of treatment, combining treatments to increase therapeutic results will be a test basis. I am through concepts on the table. What you decide on will be the development and testing. In the future others may follow the protocol being constantly developed or follow your system or Samuels. Out of that we get case studies and a baseline of results to improve on. Wikipedia did this for knowledge. Same system but for holistic disease treatment. The one thing I always say is to follow your body and gut instinct. I sent a cancer protocol to a friend in Papua New Guinea. He has a gut instinct to add a herb. He told me why and I said go for it. The result, wow, in 10 days, out of bed laughing and being normal. So be bold. now and then I will get rashes on the left and right side of lower stomach..not sure is if this is the kideney area or not.. The more I study the more I realize the fungi can be a major factor in disease. The Candida cancer connection was the big eye opener. I am working toward a Candida treatment based on know effective treatments. my e-mail is dillup1@gmail.com feel free to write. You mentioned a 5 day fast – did that help you? I still feel 10X better with the eggs and I feel I can pull this off. 2/ when juicing spinach – i get lots of “foam” as opposed to juice.. I add celery/carrots to make it liquid. I am using the CHAMPION juicer – it filters out the fiber – juice only. Is this OK? when you guys mention juice – are you inlcuding the fiber or just pure juice? 3/ I do not juice brocoli stems – just the green part. Should I include the stems? Better to take the vitamins before 3pm if it keeps you up. Better to take supplement over the day as the blood become a bath of nutrients. Yes juice the broccoli stems. I also filter the fiber with a strainer as the pulp build up in the colon. The drink ingredients are good except for the caffeine. I have used caffeine booster during a fast due to massive workload and no energy but afterworld I feel horrid for 2 days and my blast of productivity get lost. Best is a brisk shower. My Udos choice and barley grass powder arrived this morning. I juiced some lettuce, Garlic, Ginger and 2 handful of blackberries, diluted in water, added some barley grass powder, a tablespoon of udos choice, and proceeded to drink. felt a bit nauseous, but got half way through, then i added an Organic free range egg (which had me puzzled, the white part was a little yellowish, and the yolk was rather light, ive never seen a free range organic before though). So I added the free range organic egg, and added more water, took a few sips, and Vamoossh, it all came out, i vomited it all out, quicker than I had drank it. I dont think im going to manage to Drink eggs, and as far as veg juice, I think only cucumber and celery will stay down. Tom, I’ve been reading a lot of people say that for Candida treatment, juicing carrots and apples is ok?? Is that the case, I thought carrots had a lot of glucose, and fruits except blackberries were a no go.? Also Tom, I dont think i’ll manage to keep raw eggs down, do you think I can make do with the supplements alone for the kerataconus/candida treatment? Oh one other thing, is there any studies or reports/testimonials on people treating weak eye sight with a fast? Nothing I could find. I do remeber a person getting healed in a fasting book but I read it many years ago. To me you have nothing to lose. Fasting has healed or improved a vast number of condition. I just think that no one has applied it yet. Juice fasting is the most powerful for cellular regeneration and that is what is needed to cure Keratoconus. I would drink the carrot just as vitamin A does have a connection with eyesight. I’ve been reading the posts about candida and wanted to convey some info. My wife had trouble w/ yeast several years ago and did a lot of research, and treatment. Tom, I’m sure she would be happy to talk to you directly about her experience, and results with treatments. She read 2 books on the subject from, Dr. William Crook. She had very good results, and is symptom free at this point. A few things she mentioned in my brief talk with her is that “all” fruit, sugars, yeast, white rice, flour and some veggies are eliminated for the first few weeks of the treatment due to the glucose levels in them. Also, probiotics are very important in fighting candida! Garlic, and Oregano were 2 of the important herbs in fighting yeast. I have been pondering candida info and one doctor stated that diets only reduces the symptoms. That is about oxygen levels as fungus love low oxygen environment. I wonder if anyone has cured candida through exercise. Oregano and garlic for sure should be in the protocol. Looking at hydrogen peroxide, but to me it does not make sense. forgot to post yesterday.. I woke up a few times during the night but better than previous.. I gulped 4 raw eggs & had my juices – i think eating raw eggs is psychological- They don’t taste that bad. On the mental side, not as sharp and I prefer doing easy things and ignoring whats most important – danger! I feel each day will get better – raw eggs are doing it for me i think..we will see. Tom I promise to get you my eye stats and get the name of the “bug killer” I know some of the Vitamens inserted directly into my blood stream were B Vitamens.. The peroxide sounds very fimilair and I wonder if he used that too? It took a good 30 minutes or more to get all this stuff in my blood stream via IV..
Water fasting always reduces Candida by reducing blood sugar many die and other go dormant and revive with higher blood sugar levels. But, a longer water fast with some green juices may give the immune system enough time to kill most of the Candida. The point that exercise made your Candida worse suggests that people the concept of hydrogen peroxide boosts oxygen levels is a myth. But that is so easy to check with an oximeter( blood oxygen meter). Maybe some one has done that. Being that the main location for candida is the colon, it makes sense that the salt flush and a enema with sodium bicarbonate and taking probiotic should kill the yeast in the colon. Great to here that you are doing well. I found that I hit the training wall quicker and had to push more but like you said it felt strangely good. Hi Mike, A good friend of ours uses plain yogurt spread over her skin on yeast infected areas. Although, neither I nor my wife have ever tried it. But, probiotics being a yeast fighter it does make some sense. I haven’t heard of oregano used topically. Only as an oral remedy. Some miss-understanding – I do not have yeast symptoms today – I was just sharing my battle with it years back since people were asking about it here on this board. Oxygen: I do have a bad case of sleep apnea & I wonder if that had anything to do with oxygen/yeast? 1/ How many raw eggs per day is too many? I am doing 6 or 7 per day when i feel hunger pains. 2/ it is also noted in your plan that eggs should not be refrigerated.. However all eggs are refrigerated in the store – Question: do we take them home and not refrigerate? sounds like that may not be good for the eggs? 3/ also, despite all the water I am drinking, I tend to retain water. I went for a run, weighed myself at 199.. as the day wore on I am now at 202. Same goes with the steam room.. where I can see a drop of 3 lbs easily when leaving.. so far, I think I have lost 5.5-6 lbs since the start of this fast if I use the same venue of measure! I felt very bad today earlier in the day and could not work.. I am doing ok now @ 5:00 PM. I am still not back to the mental power prior to the start of this thing. Physically I can do this – the mental part is still slow, I am forgetful – just alot of effort when trying to concentrate. I committed another sin today – I had a 5 hour energy drink and bam I see my vision affected.. the ingredients are not supposed to be bad (except the caffeine).I wonder if caffeine is causing nerves to jingle around the eye? The eggs should be refrigerated. Yea 6-7 is fine. I am testing some theories and using about the same amount. I came up with a great flavor. 4 raw eggs, 1 or 2 teaspoons raw honey, 1/4 teaspoon of cinnamon. It is like the best shake on earth. A touch of vanilla extract would be better. Water retention can be due to many factors. Is this a long term condition or recent? I have found that coffee for some can be very destructive to health and caffeine reduce healing capacity. Green tea would be the best choice. Ginseng is also a stimulant. I completed day 1 yesterday (had a friends party the day before). I took 250ml of veg juice (carrot, cabbage, asparagus, cucumber, broccoli, handful of blueberries). I researched candida a little more, and am shocked that I have been living with various symptoms for so long. At the age of 5 (when i first started wearing glasses) I had a rash on my eyelids and on my face, it would get better at times, and worse at times. I remember visiting many doctors, but it just disappeared, cant remember how though. I have had patches of scaly dry skin on various parts of my body, first on my knee for 6 odd years, then on my neck for about 2 years, where it is currently presiding. I also have hayfever, dust allergies, perfume allergies, chronic fatigue etc etc for the past 6-7 years. And, I have eye floaters to go along with my kerataconus, but I have an optimistic view on life, and am confident I can naturally cure all these. Yesterday I felt good, even though I didnt have much juice (250ml in the morning), and the rest of the day I didnt have much water until the evening. I did have slight carbohydrate cravings, but persevered through. I now understand the intense craving I used to have when I did the keto diet (low carb, high protein, high fat, high fibre) were due to the candida. 1. I had some v8 juice today, its all from concentrate, but contains tomato concentrate (which is a fruit), are tomatoes (juice) off limits for candida? 2. some people say the following fruit juices are ok for candida juice treatment, can someone please tell me whether they are ok or should I stay away? 3. Tom, can I use blueberry concentrate, organic, nothing else added? Blueberries are expensive here (approx £15 per kg), and I need to use a substantial amount to get some juice from them. The juices are good. Tomatoes are high in acid and this tends to aggravate Candida. Unless you have a good juicer you will not get much our of blueberries. Maybe just eat 5 or 10 day as if they are a vitamin. But the concentrate sounds good. I have decided to add nano silver to all treatment protocols, and most importantly for candida and any long term systemic infections. Iv been living off about 500ml of blueberry juice (made from organic concentrate) for the last few days. I managed 8 days before i had to go to a party. A friend is getting married so i may not be able to do a long term fast til end of the month. Im going to do another 10 days fast staring today, then take 4 days to break it, to be ready for friends wedding. Iv been taking the supplement, Lutein/zeaxanthin, Soya lecithin, selenium, vit B2 regularly, along with half a spoon of Virgin Coconut oil, Xylitol and Meluca Honey every day. I am starting to feel the candida dying off slowly, and feeling better day by day. After 7 days my body was starting to bring back old illnesses/skin rashes etc and they were disappearing next day. No difference to eyes yet, but I think (with no basis to this thought btw) that my body must first kill off a number of other diseases/illnesses etc before it get around to the kerataconus. But I have been very busy as of late, and have been documenting all my fast though, will post it all end of month. Tom, I have ordered some nano silver, what is the recommended dosage for candida? I am not sure as that depends on the particle size. Follow the direction on the body. The more I study nano silver the more excited I get. We are looking at it for AIDS treatment at a DNA level.